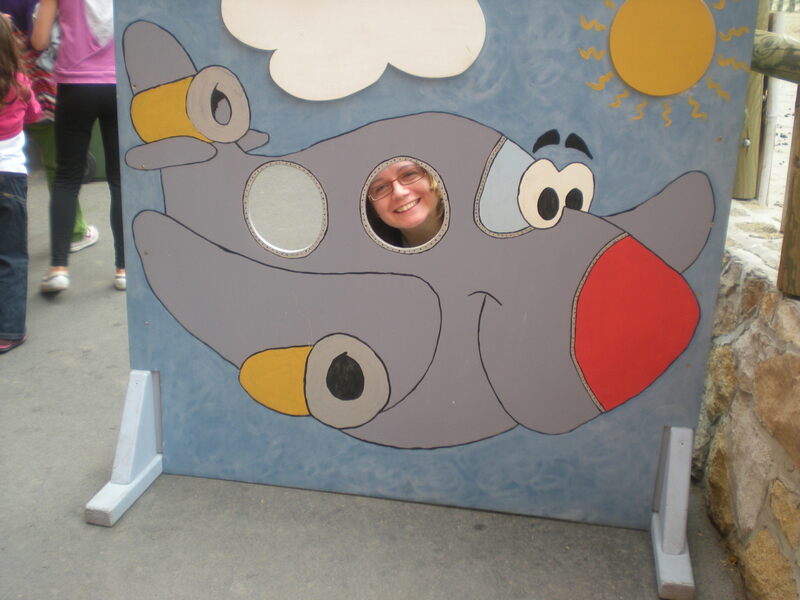 On our epic tourist Saturday, we visited the Budapest Zoo. Györgyi had only been once and I wanted to go to see the baby rhino, Lisimba. We kind of thought that it wouldn’t be that crowded, since it was a touch cold and threatening rain. But we were wrong. 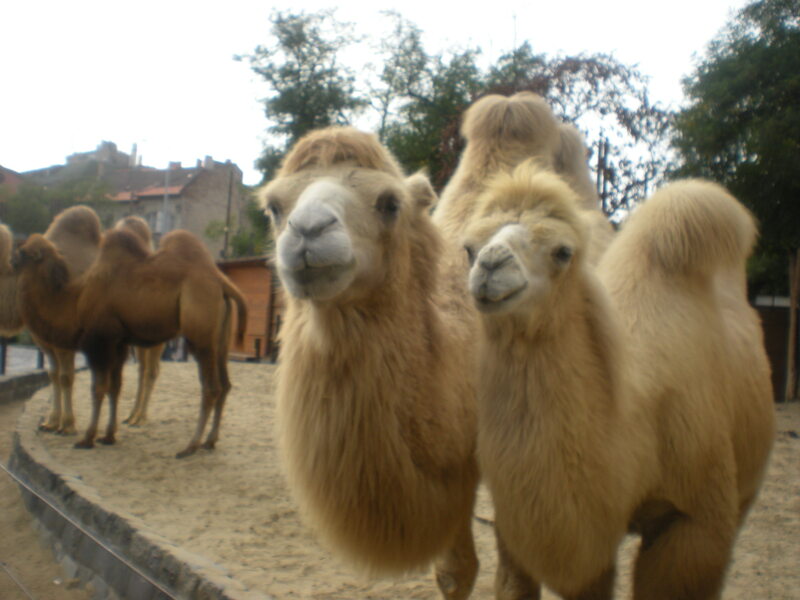 As the second oldest zoo in ALLLLL of Europe, and located in City Park, it was crowded, like it always is. 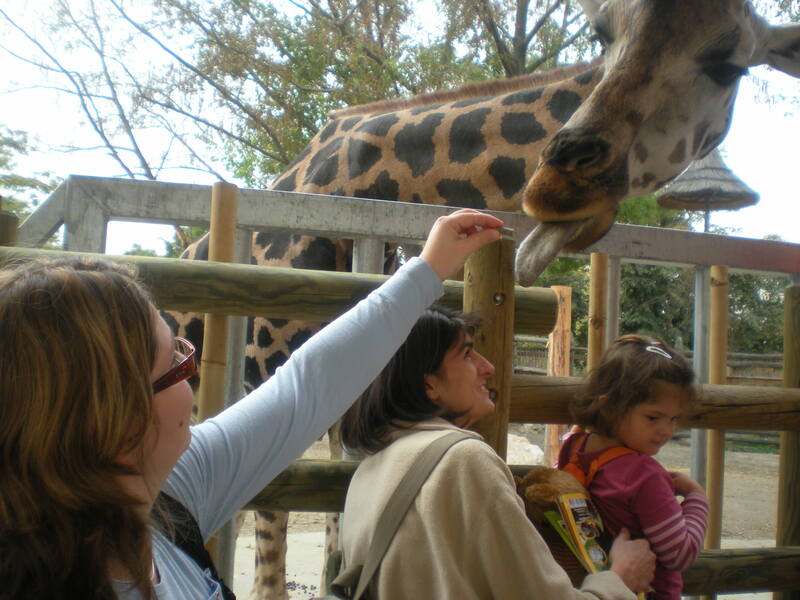 So here’s the deal with the Budapest Zoo: Whatever animals probably won’t kill or chew on you, you can pet and feed. 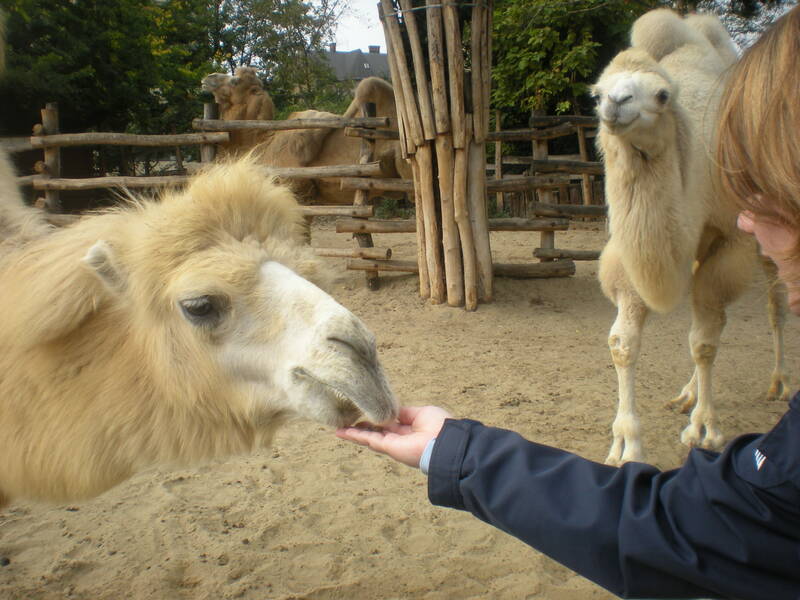 As you can see from the picture there, Györgyi was feeding the baby camel. There was a bigger camel locked up. 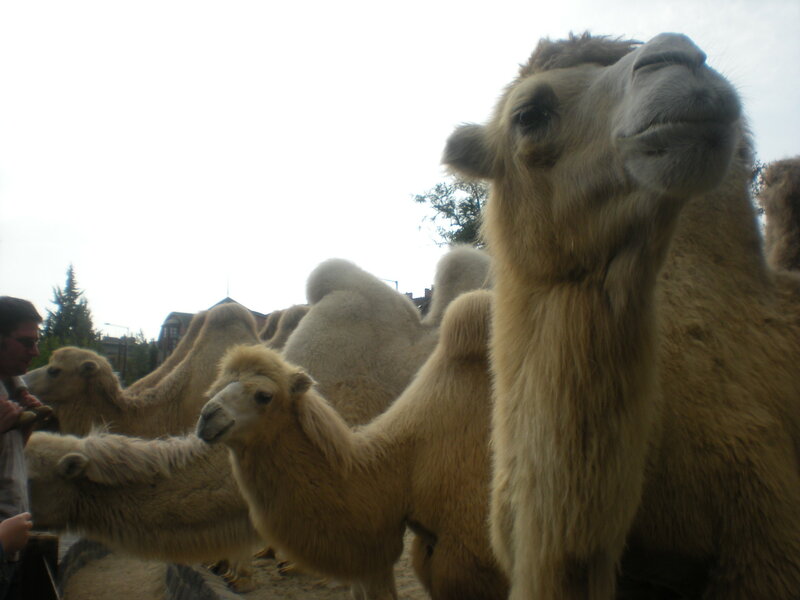 And I mean BIGGER, like morbidly obese, so the other camels didn’t really fight for the food since he wasn’t there. And when they took the little food pellet out of your hand, they sort of wrapped their lips around your entire hand and then dragged their wet gums away. It felt really bizarre and cute. 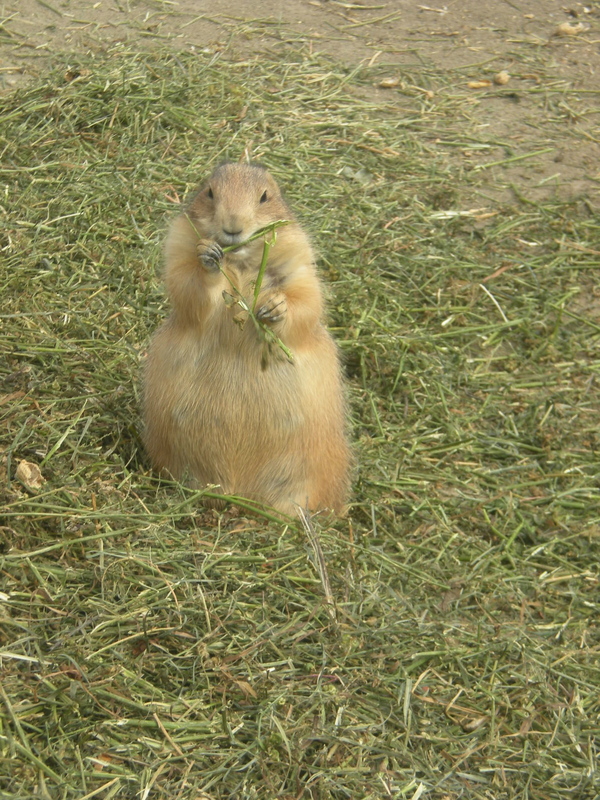 I was kind of partial to this fat prairie dog eating grass, though. 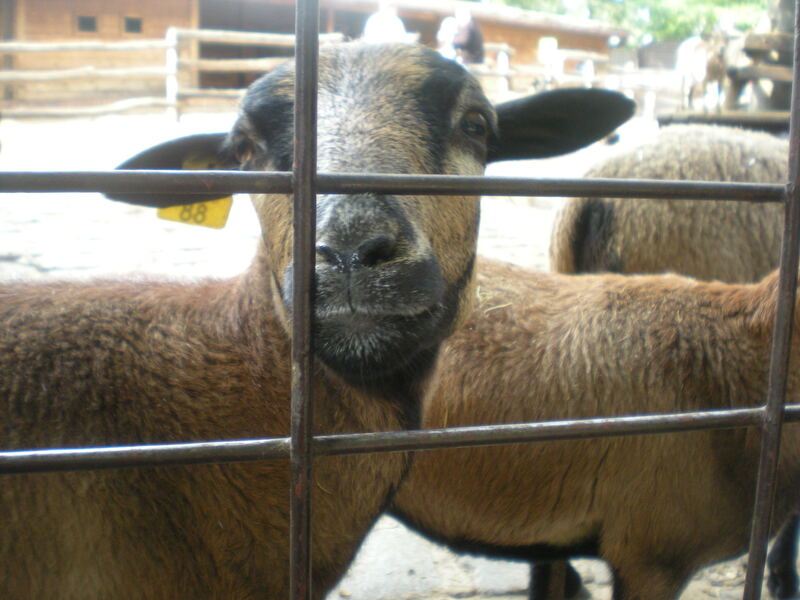 There was a whole “Hungarian farm” exhibit space so that kids could go inside with the goats, the sheep and cows and DELICIOUS mangalica pigs, etc. 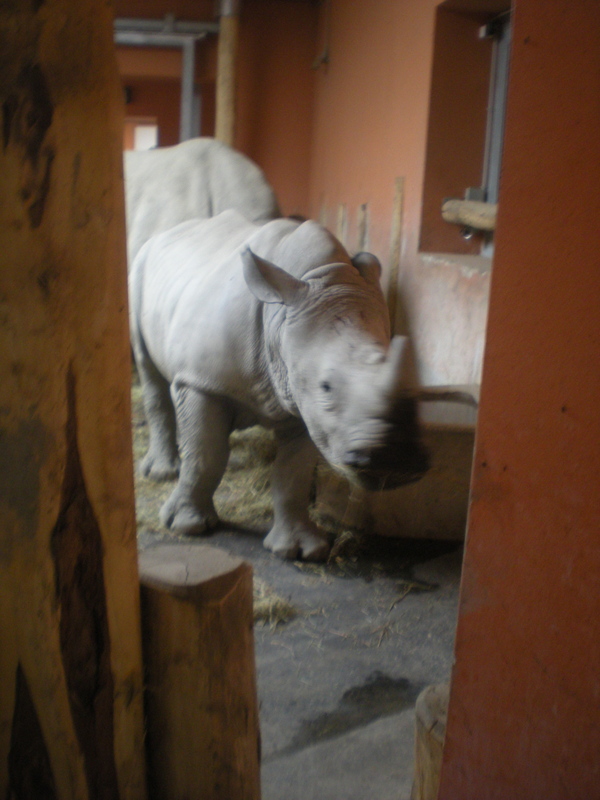 As you can see, it wasn’t much of a baby anymore, but in terms of rhino-size, this cutie was pretty little. 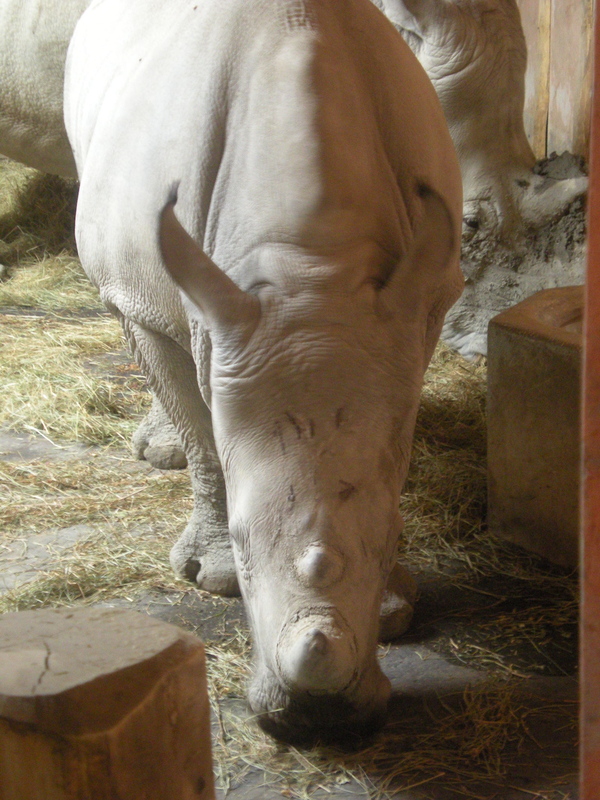 Obviously you can’t feed the rhinos at the Budapest Zoo. 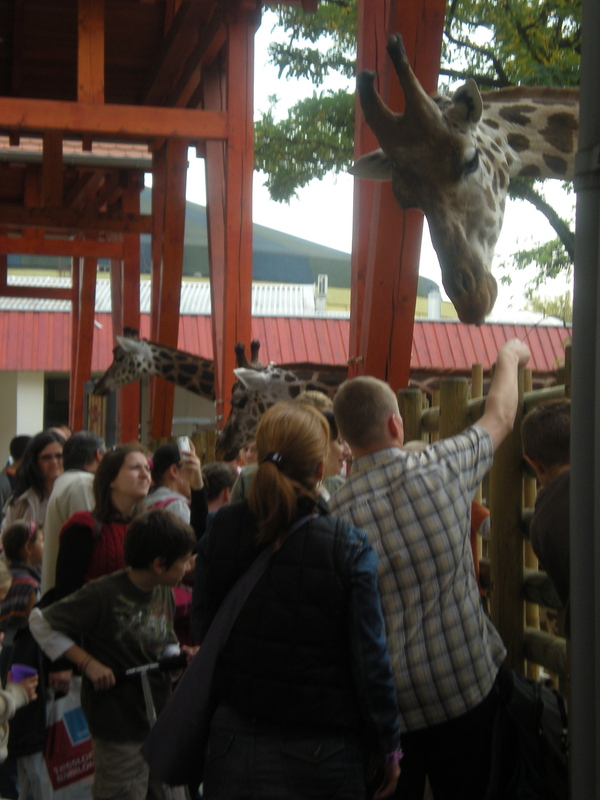 So then we went outside of the rhino house and stumbled upon a big crowd feeding the giraffes. 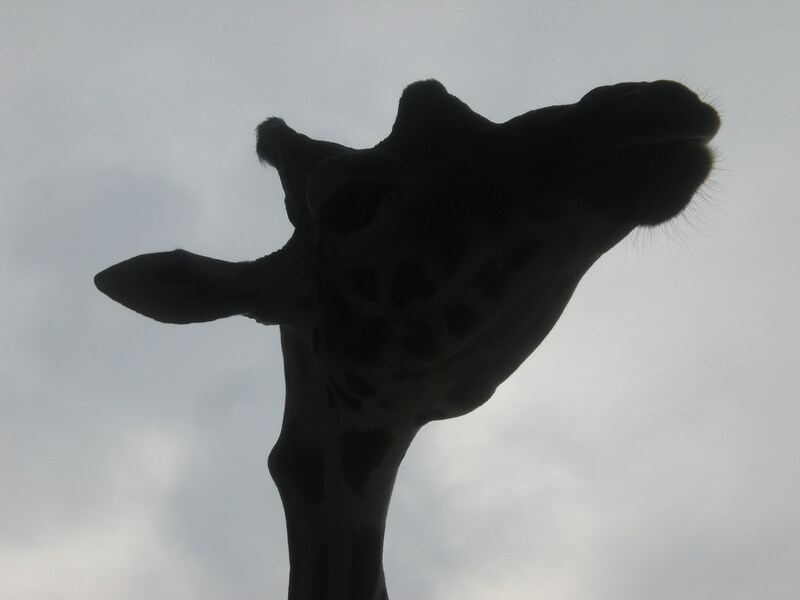 First of all, let me just say, I have never been so close to a giraffe in all of my life and it is an absolutely amazing animal. But they’re not horses, which was a concept that some of the people there were having a hard time grasping. 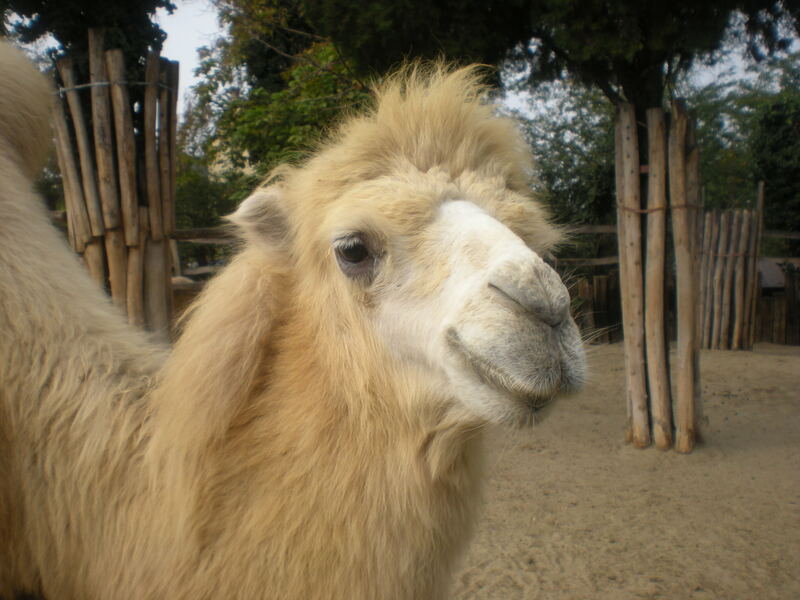 When they bent their long, amazing necks down to get the food people tried to pet their faces like you would a horse. 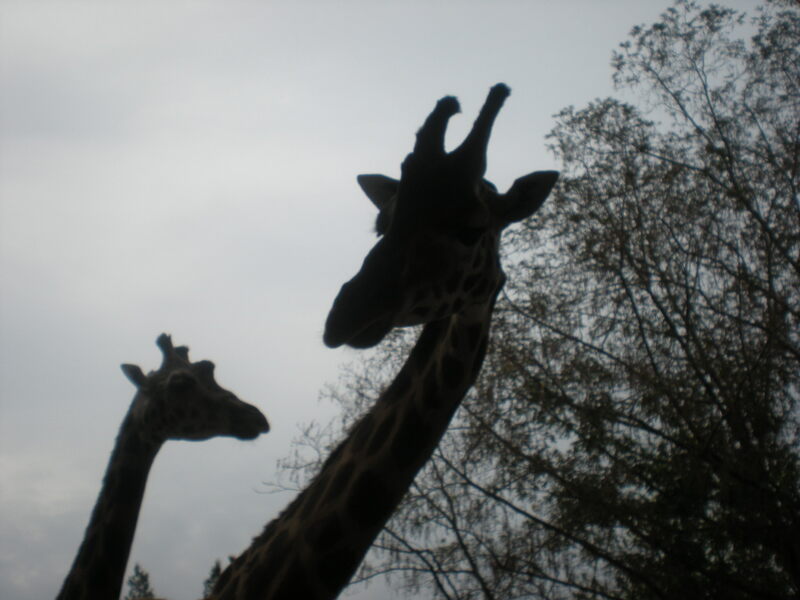 (By the way– a giraffe is usually a very very docile animal, but that 550 pound neck that it holds up can kill a lion, if it feels threatened of course). 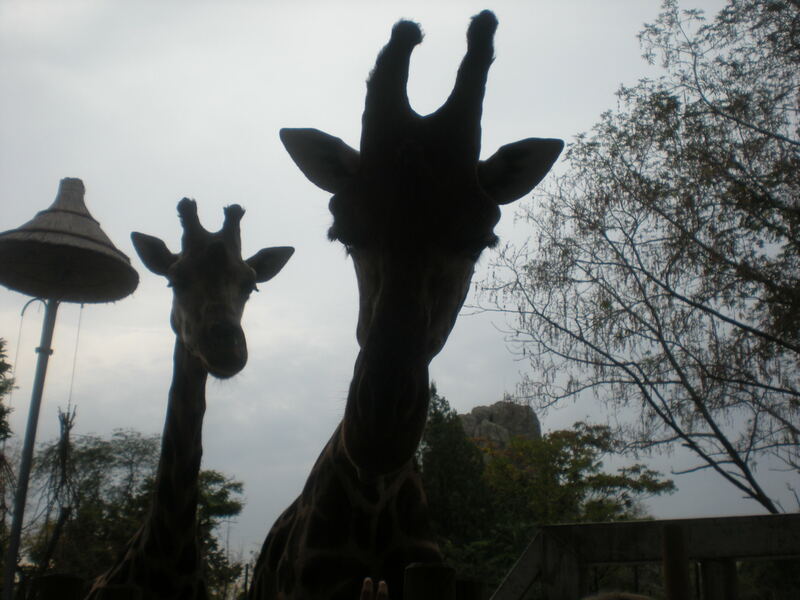 Of course the giraffes didn’t like it, they kept shaking their heads away and people kept petting their faces. 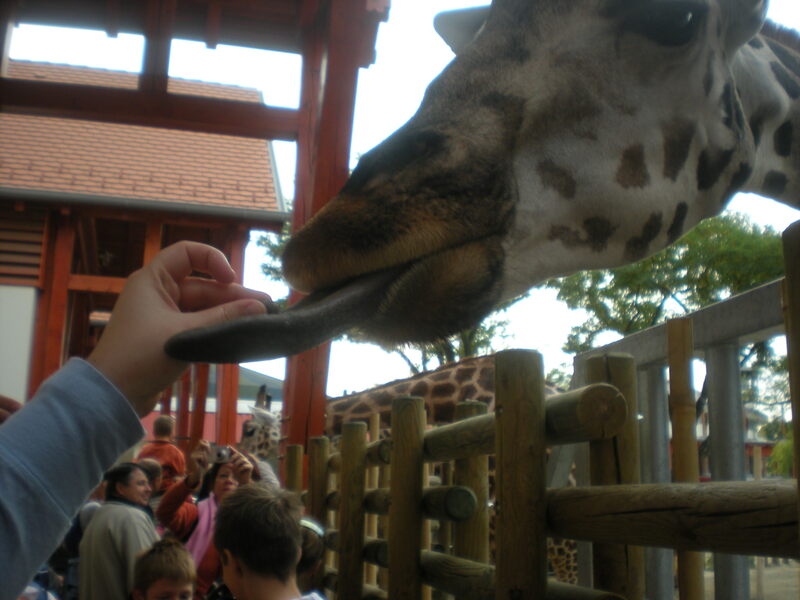 So Györgyi took it upon herself to demonstrate the correct way to feed a giraffe. 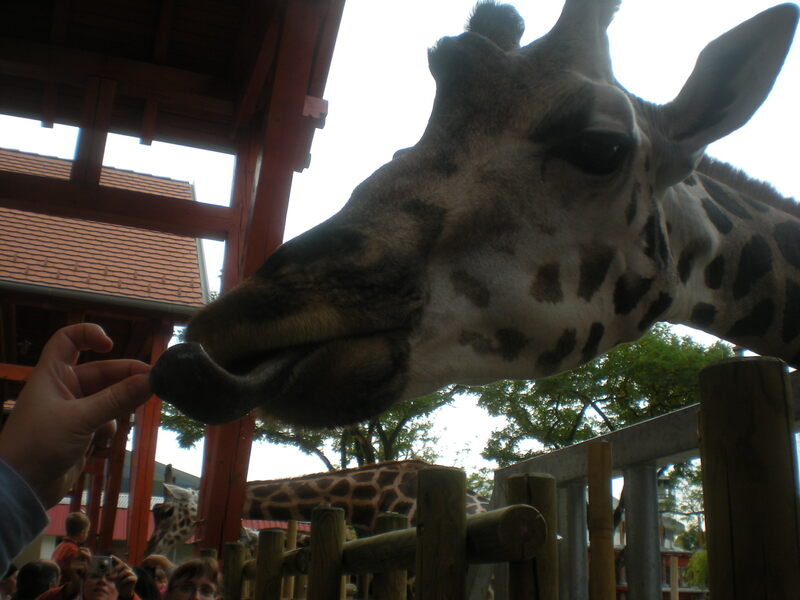 Let the giraffe’s tongue come to the food! 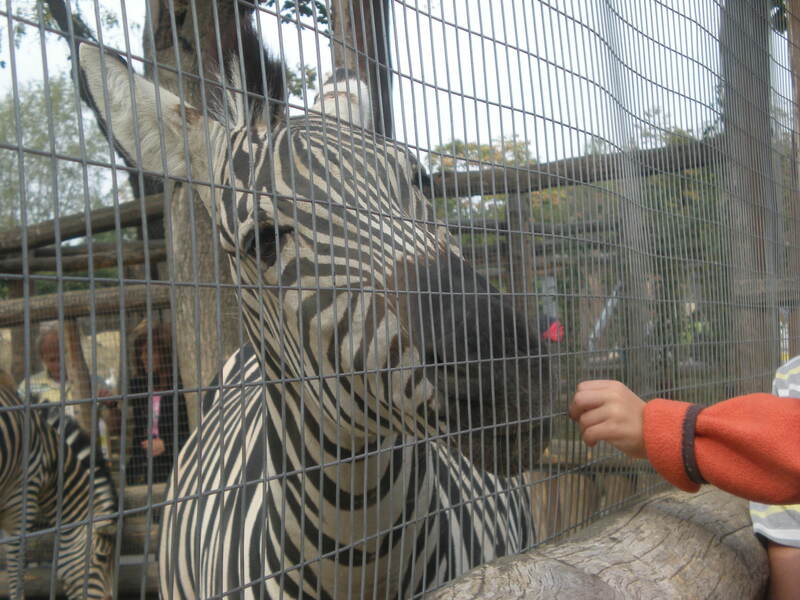 After the giraffe habitat, we decided to start heading out of the zoo. 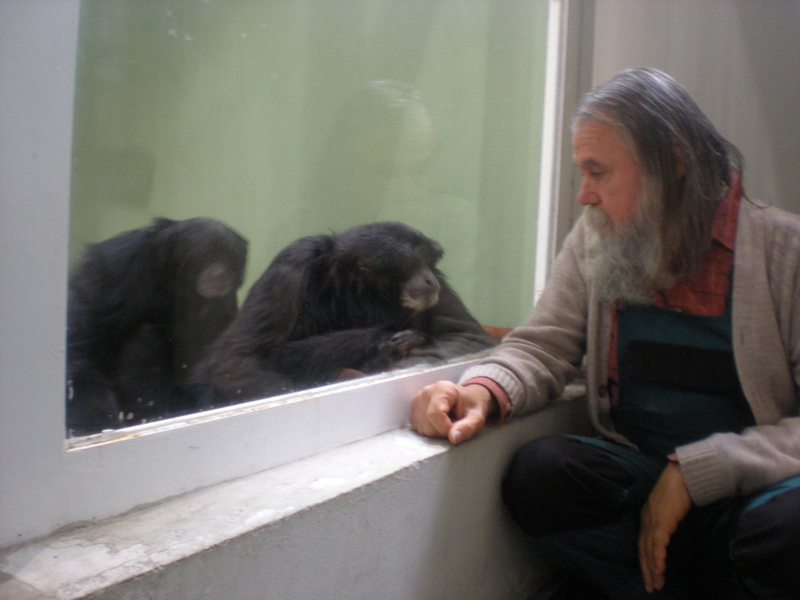 We made one last stop at the indoor monkey habitat, where this employee sat down by the glass and suddenly all of the monkeys flocked over to him. After Györgyi posed for a few pictures, we felt our stomachs rumbling a bit, and decided to head out of the zoo and back to City Park to eat some soup. More on that, and more, tomorrow. Yes this is psibsole. Some animals can get sick from other animals and if you do not properly clean your hands, clothes, boots etc you could track in bacteria that could harm your other animals.This seems quite unlikely, but i suppose it is psibsole.